Questa lussuosa villa si trova nella zona più esclusiva di Puerto Vallarta a soli otto minuti a sud del centro e ca. 25/30 minuti dall'aeroporto. Il South Side di Puerto Vallarta, dove la montagna incontra l'Oceano, è stato riconosciuto a livello internazionale come il 'Golden Zone di Puerto Vallarta.' Questa zona è anche conosciuta come la 'Mexican Riviera'. Questa è una delle poche case a that's Puerto Vallarta DAVVERO IN SPIAGGIA ... sperimentare la comodità di prendere a pochi passi giù fuori della vostra piscina nelle sabbie di Playa Punta Negra ... una delle migliori spiagge di Puerto Vallarta. Esperienza mattina e sera passeggiate attraverso il nostro balneare ideale bella famiglia. Godetevi la nostra cuoca servirvi 3 pasti al giorno ... il nostro governante si coccole con bevande e la nostra donna delle pulizie facendo attenzione che la villa è immacolato per voi ... personale di servizio incluso nel prezzo. La nostra villa dispone di 6 camere da letto tutte con A / C, ventilatori a soffitto e bagno completo. Ogni camera dispone di 1 letto king size e una delle camere a parte il letto king size ha anche 1 letto matrimoniale. Forniamo wifi, TV satellitare, schermo piatto, altoparlanti e sistema audio a livello di pool, vi aiutiamo a coordinare il transito e barche / pesca / immersioni a Los Arcos punto di riferimento, le attività zip line. Nel piano inferiore abbiamo un grande patio esterno con enorme spazio salotto, mangiare all'aperto e bar. Soggiorno in una delle migliori case a Puerto Vallarta ... rilassarsi nella nostra vasca idromassaggio, mentre la lettura di un libro ... sentire il suono rilassante dell'oceano ... con tutti i servizi giorno in attesa con ansia per coccolarvi! We had such a wonderful stay at casa paty. The home is incredible and was perfect for our group of 13. We enjoyed the surf, beach, pool and indoor/outdoor living. The staff was wonderful and so accommodating and jonathon was like a personal travel agent arranging our activities! We loved our stay! Beautiful vacation, we will never forget! Jonathan was so helpful and did everything to accommodate all our wishes. Staff ....all amazing....Emillio was always there, staying late hours and being there in the morning before we are awake, ready to help ! It was 12 of us, all adults, celebrating 4 birthdays and it was a beautiful week in Puerto Vallarta. We would love to come back again! Staff - The team of 3 were kind, attentive, and helpful. The house was kept incredibly clean every day, the food was prepared on time, and the drinks/pools toys/beach chairs/towels, etc were available at all times. The team went daily to the store for provisions and provided receipts for all items. We had a group of 8 and always felt well fed. House - The house is in a great location just south of the romatic zone (it's about a 10-15 uber ride aways ($3.50 USD). The beach is practically private and is immediately off the pool. There was ZERO seaweed. It was incredibly convenient to be able to go from the pool, to the house, to the beach for drinks and the bathroom. The house isn't as pristine as the pictures may show, but it was always perfectly clean and well maintained. Where else can you find a place for 14 total people for the price? This place is a gem located on a wonderful sandy beach. Very convenient location in order to visit downtown or staying home and relax. The staff was very helpful and attentive. The house is perfect for big families or a group of friends. You have everything you need and more. This is a beautiful home with a great staff and you always have direct communication with the owners. Thank you for a memorable vacation! My friends and I had a fabulous long weekend at Casa Paty to celebrate my 40th birthday! Jonathan was very responsive to communication and even had his brother, Gary, fly in from Mexico City to greet us upon arrival and the staff welcomed us with margaritas and guacamole too, while giving us a tour of the house. During our stay, the staff (Emilio, Sergio, Luz) were very accommodating to our needs and dietary restrictions making our meals and stay seamless. 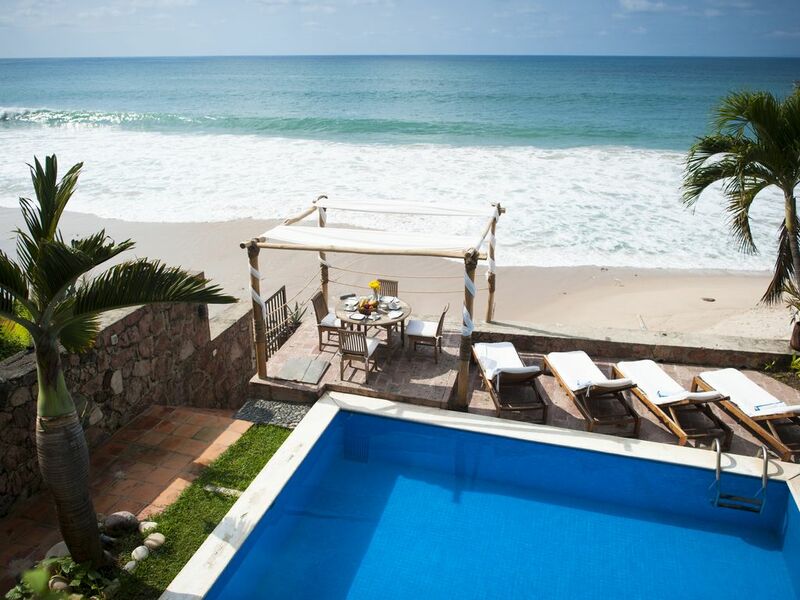 Overall, the villa was absolutely beautiful and in a convenient location minutes south from Downtown PV via Uber on a semi-private beach in a secluded cove that was accessible for swimming and not too rocky. Everyone in my party had an amazing time and said they would definitely come back and/or recommend this location. Thanks for being such great hosts! RATES ARE TOTAL, NO EXTRA FEES We have no refunds unless we are able to re rent the same days at the same rate. In that case we would only deduct 10% from the total for operation costs. Check in 3:30 pm Check out 12:00 pm Guests usually arrive or depart on a Saturday or Sunday. During some months, we request a 7 night minimum stay. We will not be liable for any delay or failure in performance of our obligations which results from any circumstances which is beyond our control directly or indirectly i.e. act of God, war, terrorism, fire, flood, lightening, explosion, fog, sickness, pilferage, machinery breakdown, interruption of utility service, strikes, labor disputes, or outside noises. We shall not be liable for injury, damage, loss or accident during your stay at the villa.